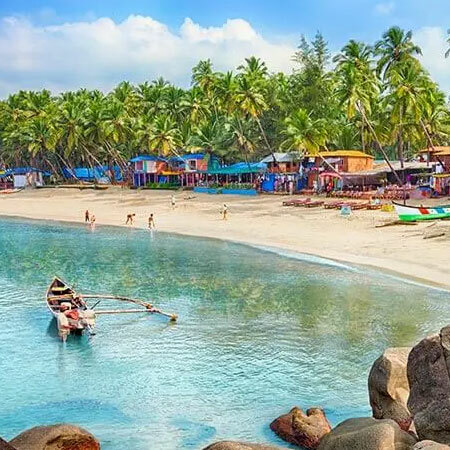 Apart from being the smallest state in India, Goa is an ultimate tourist destination among other regions on the West Coast of India, popularly referred to as the "Pearl of the Orient". Goa was an erstwhile Portuguese colony. With the kaleidoscopic blend of Indian and Portuguese cultures, Goa attracts millions of visitors all across the globe every year. The mesmerizing scenic beauty, golden palm - fringed beaches, architectural marvels of Portuguese, Hindu and Catholic shrines, Magnificent forts, and authentic Goan cuisines is what makes Goa a splendid tourist paradise. Goans are known for their tender - hearted hospitality. Their friendly and welcoming nature amazes everyone. Agonda beach, Baga Beach, Candolim Beach and Calangute Beach are some of the stunning beaches in Goa. Asia’s Unique Naval Aviation Museum and Asia’s First Printing Press belongs to Goa which is a well - known tourist landmark. Goa is one of the favorite picks among the most beautiful honeymoon destinations in India. If you opt for a spiritual tour, Church Of St. Augustin, Se Cathedral, Basilica Of Bom Jesus, St. Francis Of Assisi Church, Shri Mangueshi Temple, Shri Mahalaxmi Temple, and Shri Shantadurga Temple are great options. Goa offers daring watersports and thrilling activities for a fun - filled and an adventurous vacation trip. Goa is a dream destination for many millennials. A trip to Goa is a dream come true and makes you feel like heaven.